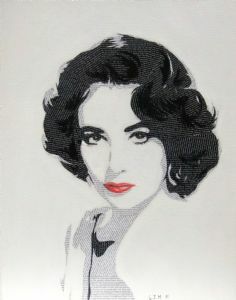 Description: Literally Elizabeth Taylor, Mixed media finished off with acrylics. Collage made up of text from her bio, stuck onto canvas. I have always been interested in art, from a very early age I was always drawing things on any old scrap of paper. I started painting in water colour when I was 16 doing mainly paintings of animals which I would give to members of my family. From there I progressed onto oil paints. Producing copies of work by great artist such as Salvador Dali, Rembrant, Degas, Cezanne and Renoir. I now mainly work in Acrylics and have started to experiment with spray paint. 'Modern day street art and beyond' Group exhibition 21st Sept 2009 to 24th Oct 2009 at The Knapp Gallery, Regents College, Regents Park, London.